Equipped with in-depth species accounts and illustrations like the paper edition, but also fitted with sounds and identification tools, this is the most complete and dependable birding tool for navigating New Guinea’s tropical environment! 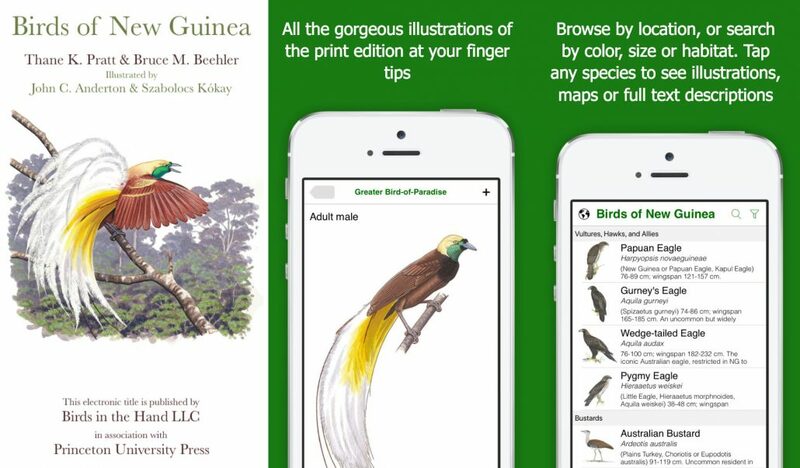 This is an interactive mobile field guide version of Princeton Field Guide’s acclaimed Birds of New Guinea by Thane K. Pratt and Bruce M. Beehler, with illustrations by John C. Anderson and Szabolocs Kókay. Like the paper edition, this is the most complete and dependable birding tool for navigating New Guinea’s tropical environment. Birds of New Guinea includes over 750 species complete with detailed color plates, concise species descriptions, accurate range maps, and audio recordings. Furthermore, Birds of New Guinea simplifies bird identification with an interactive Smart Search tool and it makes it easy to keep track of bird sightings with an updatable life list. Birds of New Guinea is an essential tool for all bird enthusiasts visiting or living in New Guinea. This mobile application was developed through collaboration between Princeton Field Guides and Birds in the Hand, LLC. Audio recordings were compiled and edited by David Bishop and Iain Voxvold.